Yuonesi, M. (2018). Physical Study of Nano Ribbon and Tetragonal Bundled and Isolated Nano Tube SIC (7,0). 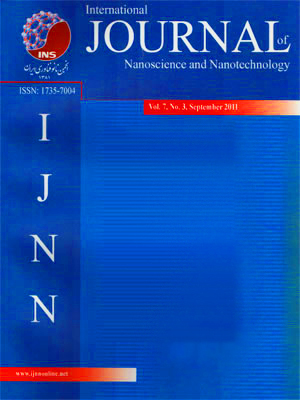 International Journal of Nanoscience and Nanotechnology, 14(1), 85-92. M. Yuonesi. "Physical Study of Nano Ribbon and Tetragonal Bundled and Isolated Nano Tube SIC (7,0)". International Journal of Nanoscience and Nanotechnology, 14, 1, 2018, 85-92. Yuonesi, M. (2018). 'Physical Study of Nano Ribbon and Tetragonal Bundled and Isolated Nano Tube SIC (7,0)', International Journal of Nanoscience and Nanotechnology, 14(1), pp. 85-92. Yuonesi, M. Physical Study of Nano Ribbon and Tetragonal Bundled and Isolated Nano Tube SIC (7,0). International Journal of Nanoscience and Nanotechnology, 2018; 14(1): 85-92. Department of Physics, Ayatollah Amoli Branch, Islamic Azad University, Amol, Iran. Physical study of nano ribbon, tetragonal bundled and isolated nano tube SiC (7,0) are part of our project in knowing new nano material such a silicon carbide. These studies have been performed by density function theory. Effect of ribboning, tubulating and tetragonal bundling on the physical properties such as stability, structural constants, optical physics, chemical parameters and magnetization have been investigated by PWSCF software. These factors are very important tools for materials engineering in nano science and technology. There is an inter-tube interaction at bundled structure that changes its physical properties.